vector: a growing list of elements. Iterators: objects that view and modify ranges of stored data. 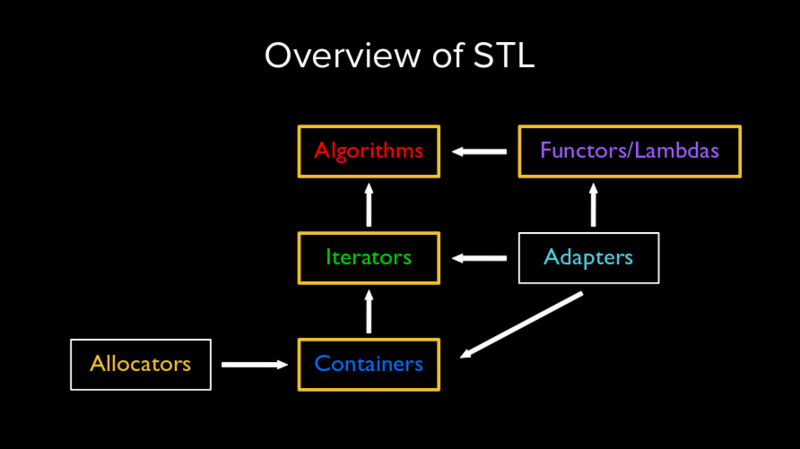 Each STL container exports iterators. Iterators have a common interface, allowing the programmer to write code that operates on data stored in arbitrary containers. Algorithms: functions that operate over ranges of data specified by iterators. stack adapter transforms a regular vector or list into a LIFO (Last In First Out) container. istream_iterator transforms a standard C++ stream inot an STL iterator. Functions: facilities for creating and modifying functions at runtime. Allocators: allow clients of the container classes to customize how memory is allocated and deallocated, either for diagnostic or performance reasons. A std::vector is an object that represents a sequence of elements. The elements in a vector are indexed, meaning that they can have a well-defined position in the sequence. The storage of the vector is handled automatically, being expanded and contracted as needed. Vectors usually occupy more space than static arrays, because more memory is allocated to handle future growth. This way a vector does not need to reallocate each time an element is inserted, but only when the additional memory is exhausted. NOTE: for detailed information about std::vector, check out the C++ reference. There are several aspects of the vector that can be troublesome in certain applications. In particular, the vector is only designed to grow in one direction; calling push_back() inserts elements at the end of the vector, and resize() always appends elements to the end. A std:deque is an indexed sequence container that allows fast insertion and deletion at both its beginning and its end. As opposed to std:vector, the elements of a deque are not stored contiguously: typical implementations use a sequence of individually allocated fixed-size arrays, with additional bookkeeping, which means indexed access to deque must perform two pointer dereferences, compared to vector's indexed access which performs only one. NOTE: for detailed information about std::deque, check out the C++ reference or just type ?std::queue in a notebook cell to get live documentation. How can we implement stack and queue using the containers we have? Stack is a type of container adapters with LIFO (Last In First Out) or FILO (First in, Last Out) data structure, where a new element is added at one end and (top) an element is removed from that end only. Stack: just limit the functionality of a vector/deque to only allow push_back and pop_back. Queue is a type of container adaptors which operate in a first in first out (FIFO) type of arrangement. Elements are inserted at the back (end) and are deleted from the front. front() -- Returns a reference to the first element of the queue. pop() -- Deletes the first element of the queue.